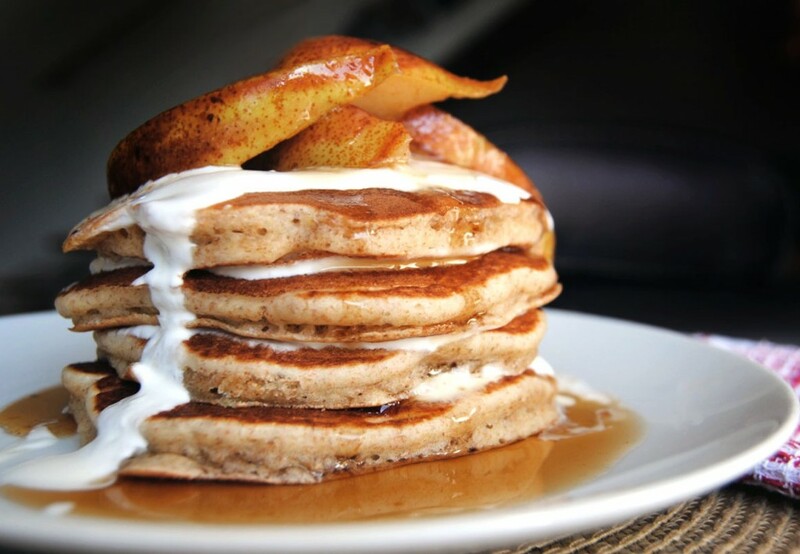 These unbelievably fluffy pancakes, topped with spiced pears, greek yogurt and maple syrup, are the perfect way to spoil yourself on a lazy weekend morning. You know when you have one of those weeks that feels like about ten weeks combined? This week was one of those. It wasn’t a bad week, actually, but it was a long one. Luckily, this weekend was daylight savings in Portugal! So, at the end of this very, very long week, I got to sleep for a whole extra hour. Sixty glorious minutes of much-needed sleepy goodness. 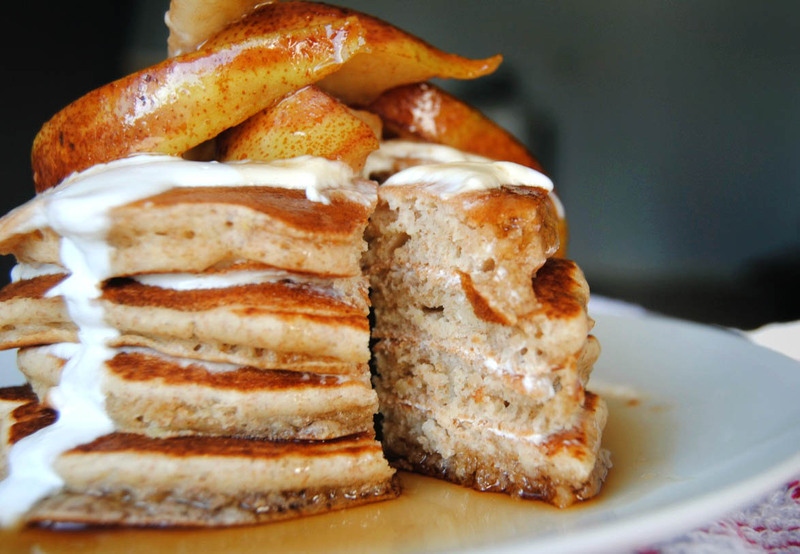 I woke up feeling refreshed and rejuvenated, with just one thing on my mind: pancaaaaaakes. This is the only pancake recipe I ever use. It’s foolproof, and always yields beautiful, incredibly fluffy pancakes. The secret is adding vinegar. Then when you mix the wet and dry ingredients together, the vinegar and baking soda react and it’s just like an elementary school science fair volcano. Well, not exactly, but the batter will bubble a bit and the pancakes will fluff up like magic when you cook them. Oh and don’t worry, you can’t taste the vinegar at all. This time around, I felt like slightly heartier pancakes so I used half white flour and half whole wheat flour. This gave the pancakes some extra flavor and texture, but still allowed them to fluff up beautifully. I often make them with all white flour, though, and they are just delicious either way. *You can use regular salted butter, but in that case omit the salt from the recipe. In a large bowl, mix together milk and vinegar and let sit for at least 5 minutes, for milk to “sour”. In another bowl, mix together flour, sugar, baking powder, baking soda and salt. Whisk egg, butter and vanilla into soured milk mixture. Add dry ingredients and mix until smooth. Heat a large, nonstick skillet over medium heat. Pour 1/4 cupfuls of batter onto the skillet and cook until bubbles appear on the surface of the batter. Flip and cook until browned on the other side. To make the pear topping, melt butter in a medium skillet then add pears and cook over medium-low heat for 8-10 minutes or until pears are slightly tender. Stir in brown sugar and spices and cook for another 2 minutes or so. Serve pancakes with pear topping, unsweetened plain greek yogurt and maple syrup. If you happen to have some pecans or walnuts lying around, sprinkle a few on top. Enjoy on a lazy Saturday or, even better, have them for “brinner” next Tuesday! How am I ever going to lose weight when you keep doing stuff like this?